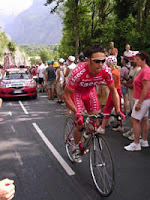 I have known for a couple of weeks that Gap-Pinerolo is now an official candidate stage for the Tour de France 2010. The tour is coming past my house! Literally past my doorstep. This is a childhood dream of immutable value to me. Now don't get me wrong as I am lucky enough to get to see the Tour de France every year. Not only that but I also get to ride many of the historic climbs that have been frequented by the heroes of cycling. What makes this special is I will only have to go outside my door to see it. This, and the fact that the route will be using the Colle Delle Finestre will make it possibly one of the most dramatic stages in modern history. The colle is Europe's third hardest climb in terms of distance, gradient and altitude. Half of the climb is on a dirt track, an old military road that winds its way up the side of the mountain. It makes d'Huez seem a piece of cake (I should know as I do both often enough.) It is set to become one of the great heroic climbs and benefits from fantastic breathtaking scenery. It has been used once before by the Giro d'Italia in 2005. Danilo di Luca was first to the top closely followed by Gilberto Simoni and proved to be one of the most exciting stage finishes in Giro history. To quote Simoni, "that climb took 10 years off me!" The only difficulty is where to watch it. Do I watch it from home and dash outside as it whizzes past, do I ride to the summit of the Colle delle Finestre and watch the pros struggle up from Suza or do I get some VIP tickets for the finish in Pinerolo? I have plenty of time to decide. Where will you be watching it from?